I’m yet to come across people who dont find comfort in potatoes. Cook it up however you want, chop it up however you wish or even smash it up and it rarely disappoints. I have many favourite ways of cooking potatoes. Baked until crisp in the oven and topped with olive oil and a mixture of my favourite peppers, baked whole and generously brushed with butter and pepper, stuffed with cheese, made into rosti with cheese, cooked with my grandmother’s spice mixture in her own special way, in a coconut based curry and stuffed inside my favourite masala dosa, I can’t tell you which of these is a favourite as I give equal marks to all of them in my book. Served as the main ingredient in a dish, it shines and when served alongside something else, it perfectly complements. How many vegetables have such attributes? The best part is I have a few staples and I continue to discover new favourites with one of my favourite vegetables. 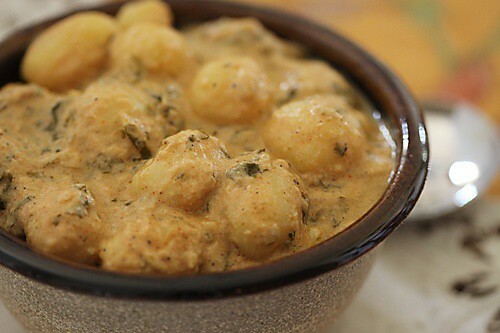 Like these baby potatoes in yogurt gravy that was served to us when we were in Bangalore. This recipe comes from a friend of my mother-in-law and has no oil in it. Yes you heard it right! Absolutely no oil in the cooking, but that should not be the sole reason for you to make this. It tastes so good that you got to make it and eat it to believe me. Potatoes taste best in this season. 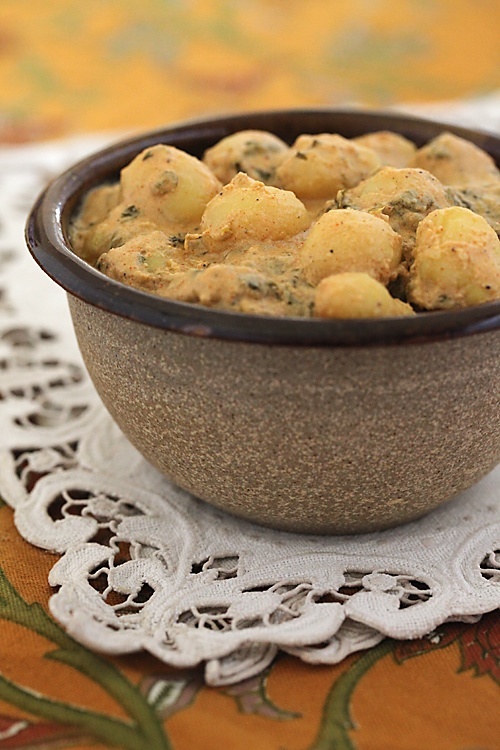 They have such an earthy flavour to them which somehow goes missing the rest of the year.This is one of the best ways to enjoy potatoes that are marinated in a spiced yogurt mixture and cooked thereafter. A little spicy and a little tangy, the flavour of the potatoes really come through in this preparation. 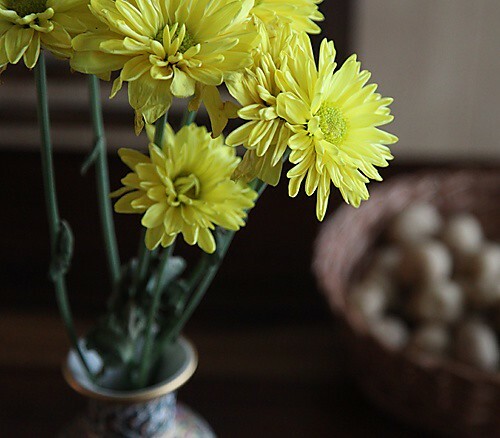 Serve it with hot rotis or some hot plain rice or a simple vegetable pulao. You could substitute the baby potatoes with an equal amount of any other potato. 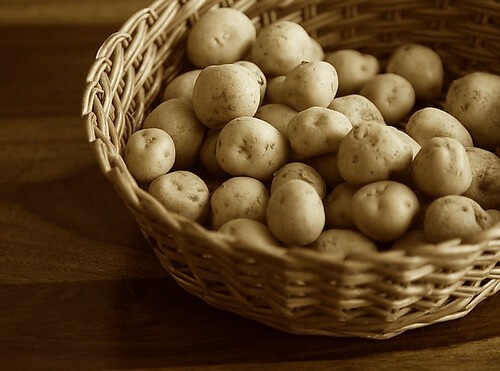 In a medium sized pot, boil the potatoes until tender. Alternatively, pressure cook the potatoes with 2 whistles. When cool, peel the potatoes and keep aside. In a medium sized bowl, whisk the yogurt to remove any lumps and stir in the ginger, coriander powder, red chilli powder, green chilli, garam masala powder, salt and coriander leaves. Stir in the potatoes and marinate for 5 to 6 hours. 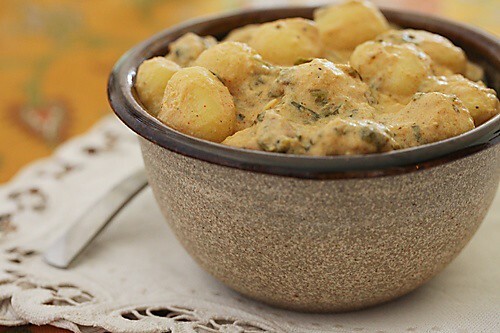 Place the potatoes along with the yogurt mixture in a medium sized pot and cook on a medium low flame, stirring all the while until the gravy comes to a boil. It is important to keep stirring to prevent the gravy from splitting. Once it comes to a simmer, take off the heat and serve hot or at room temperature. * If your yogurt is very thick, then use 1 1/2 cup yogurt and 1/2 cup water, but do keep in mind that the yogurt is supposed to be on the thicker side. Such a simple yet flavorful recipe.No oil is a plus,will try this soon. On another note–tried your bread pudding yesterday,needless to say–came out super good,will post it on my blog soon!! And by the way, you've found some who dislikes potatoes. It's the only vegetable I hate. Love the creamy potato curry and the cute vessel. potatoes are delicious andhealthy without oil. Wow Absolutely fingerlicking dish Anu… absolutely yumm with beautiful shots. Esha: Maybe I can convert you into a potato lover. This is not kadi at all. The preparation method and the taste are totally different. I'm a huge fan of potatoes. It's one of the only fresh things we're able to preserve during New England winters. The recipe looks divine! This one immediately caught my eye with the first sentence. Potato is my comfort food and this dish rocks! Am definitely going to join Simi in making this one. Slurp Slurp. 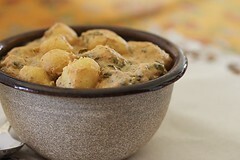 Dahi Aloo looks so delicious :). that pictures of little baby potatoes in the basket is my fav. I have gone from being a potato disliker to a potato liker ( no extreme emotions for potatoes read love/ hate). But this one was splendidly yum and the pictures are even more droolicious! @MJ: Join me in making this you said? What grt fun that is going to be! Tried this yesterday with one change and it was fabulous despite being so easy to make! One change I made was to do a tadka of mustart & jeera before adding the potato-yoghurt mixture. Maybe because of this, my curd split easily and then evaporated, leaving me with only a little bit of gravy coating each potato–almost like a panneer mixture. It was still extremely tasty! The ginger worked beautifully without being overpowering. P.S> Esha, I second Anushruti, this tastes nothing like Kadi, even in the initial stages. Welcome Vini…glad you enjoyed it! Lovely recipe! Came out splendid. Tried this recipe twice. Once – using all the ingredients you have mentioned – awesome it was! Second time – I added a little kasturi methi (dried) along with the powders before marination and the result was equally good – provided one likes the taste of methi. Let the wonderful simple recipes flowing. Do we need to keep the curd and potato mixture in the refrigerator for marination or just leave the mixture outside. Mmmm, looks delish. I just got some fresh thyme so I'll throw that in as well.